Peter and I enjoy frequenting this darling little toy shop here in Park City called J.W. Allen and Sons. Just yesterday we made a little visit so Peter could spend his birthday money from Grandma. He was in heaven! He couldn't get much with his $4 for 4 years old, but he was surprisingly very well-behaved and more than happy to settle on a box of chocolate covered peanuts which he has yet to touch. But it was the thrill of being able to spend his own money that made it exciting for him. That, and sampling all the great toys in the shop. I struck up a conversation with the owner, Jon, and enjoyed my time getting to know him a little. I'd seen an article in the Park City Magazine about some great new toys on the market and inquired about them. Turns out, he is the inventor of the toys and they are totally tubular, dude! I want you to meet PARKZARZ! These are right up Peter's alley. Snowboarders, skiers, and soon-to-be BMXers and surfers. All parts are interchangeable and they come with these cool "trick sticks" that allow you to mimic the motions of the boarders on a half pipe...or skiers on the slopes. The half pipes can also be used as actual snow molds so you can build a half pipe in the sand or snow and have the boarders (and kids) play outside. So much fun. Jon wants to do a giveaway with you today. Any set you see that you like can be yours! All you have to do is like their facebook page, then go to Amazon and tell me which set is your favorite. I also want you to tell me (and Jon) who you want to give these to and why. If you share the link to his Amazon products on your facebook page saying you think these look like cool new toys for your kids, then you get an extra 2 chances to win! -These are awesome, versatile, durable, creative toys that promote outdoor play and creativity and bring the ski slopes to you! Let's help support this local Utah business and get our kids interested in outdoor play and winter sports! My favorite is theSkier Extreme Sports Action Figure Kicker Box Play Set. It looks so neat and what little boy (my 8 year old daredevil) wouldnt love playing with them. So much different than all the army guys he plays with now! Love them!! I love the snowboard extreme barrel set! My boys are 9 and 10 and would really be excited to get a snail mail package! I am going with the snow board extreme sports action figure straight rail set! My baby boy is just a baby... but hey... we can save them for later! they look like fun! 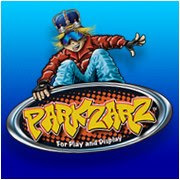 I like this one: ParkZarz Snowboard Extreme Sports Action Figure Straight Rail Play Set. Ride the Terrain Park like a superhero! These look like fun! Thought I would give them to my nephew or Save them for Cooper! I like the Snowboard Kicker Box set! But they all look so fun! I would give them to my 6 year old daughter because she is always telling me to get some toys that boys would like. That way her boy cousins or friends will want to come and play with her! This is a great new product!